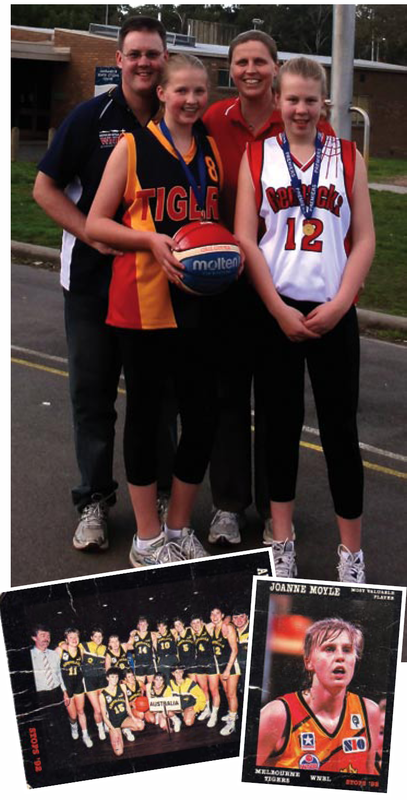 With past champions like Jo Metcalfe among us, it’s little wonder basketball is red-hot in our town. BRIANNA PIAZZA chats to a Tiger with a tale to tell. Jo, tell us a bit about your background and your family. I was born in Adelaide and I grew up there. My family and I have been in Warrandyte for about 13 years. I have two girls – Kayla, who plays netball and basketball and Nikki, who participates in basketball and calisthenics. My husband Steve and I both have sport backgrounds (he was the junior singles, doubles and mixed badminton champion in 1986) and we’ve both encouraged the kids to play sport because we got so much out of it. Can you share with us some details about your excellent basketball career? I first started playing through school and I played under 12s/14s in South Adelaide. I started to play senior level at the age of 14 in South Adelaide. Then I went to the Australian Institute of Sport for three years when I was 15. It was one of the first highlights of my career because I absolutely loved it there. After that, I came back and joined the WNBL for West Adelaide for a couple of years. Then, when I was about 20, I moved to Melbourne to play for the Melbourne Tigers in the WNBL. I made the Australian Junior Team and I went to the Junior World Championships – we won a bronze medal there. We were the first Australian basketball team – junior or senior – to win a medal at world championships or Olympic games. Then I made the senior Australian team, known as the Opals. I made the Olympic team for the Barcelona Olympics in 1992, but the team didn’t go to the Olympics. It was an honour to make an Olympic team, but not going to the Olympics was pretty heartbreaking. I played for Bulleen in 1996 and 1997. What are some memorable highlights for you? I was MVP, All Star Five and Top Scorer for the WNBL in 1991. I am a life member of the WNBL and have played more than 250 games. During the 25th year celebration of the WNBL, they named the top 25 players for that time and I was named on that list. How often did you have to train to become so skilled in basketball? When I played for the Australian Opals I worked in a bank full-time and then trained for basketball almost fulltime. So in the early 1990s, when basketball was huge, we trained five days a week – that would be on court, fitness and gym work – and then we would play on weekends. So it was pretty full on. Do you have any favourite games that stand out from the rest? I never won a WNBL grand final, but I played in two. In 1994 we played in the final against Adelaide and it went into double overtime and it stands as the most memorable grand final of all time. We lost by about six points. I had never been so exhausted in my entire life! It was the sort of game where it was the last man standing and everyone was exhausted. Another memorable game for many reasons was the first game my husband saw me play. He had no idea about basketball and didn’t think much of it and he came out to watch us play and I had the game of my life – I shot something like 35 points and changed his mind about basketball. No. I continued playing after I had my daughter, Nikki. In 1999 I blew my knee out and had a major knee reconstruction and didn’t go back to playing WNBL after that. I was about 30 and I probably was going to retire one or two seasons later anyway. Then I moved to Warrandyte and now I coach the Redbacks. I’ve been doing that for at least five years now. I miss the playing and the competition and the battle on the court, but I don’t miss the training required to keep you at that level. Even though I had my knee reconstruction, I wouldn’t change any of the things that have happened in my life. Coaching is different and I like to put back into the sport that gave me so much. What do you think of the local sports scene in Warrandyte? I think it’s great, especially as Warrandyte is rather unique in its community. I think it offers all the major sports opportunities for kids – football basketball, tennis and all that sort of thing. The kids really get into it and the parents are there supporting them. I think it’s a strong part of the community aspect. You get to see all the kids running around in their different sports uniforms on the weekend and I think the high participation rate in Warrandyte is great.